Stop… Listen…What’s that sound? 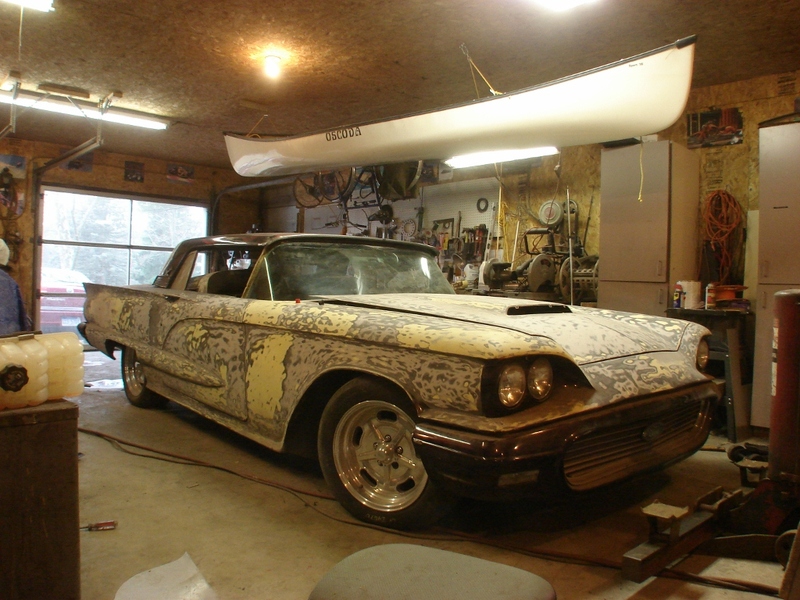 It’s a ’59 T’Bird with a 5.0 HO through a cat-less Mustang GT stainless exhaust! I got the fuel tank back from my buddy Bud Glenn (Kings Radiator, Kalamazoo), put the new fuel pump in and got the tank wrestled up into its home under the trunk. Got it hooked up, put the battery in, cycled the fuel pump a couple of times to purge the lines, and the car fired up like it’d been run yesterday! Gotta love fuel injection! I am REALLY relieved that the injectors aren’t plugged from the ancient fuel, it runs perfectly and sounds GREAT. I did have to replace ALL the sections of rubber fuel line at the filter, and tank connectors, they were all dry, brittle and leaked. I’d forgotten how good the car sounds, just like a Mustang GT from the late 80’s, which is what the drivetrain is from including the complete stainless exhaust. When I started DA’ing the paint off, I took the H pipe out, cut the converters out and gutted them, then welded them back in place empty. It makes a big difference in the exhaust note, it’s pretty “snarl-y” sounding. I’ve been sick the past couple days, but later this week I hope to get the late 70’s T’Bird/Cougar disc brakes rebuilt, bled and get it mechanically wrapped up. I’m excited about getting it running again, and really looking forward to getting the body ready for its new tu-tone silver/charcoal paint scheme. I love this car. I think it was one of the most classy cars of its time. Love the square bird. What are your plans for the front bumper? Will. It be painted? Looks de-chromed in the pics….? Thanks. The bumper is painted, the car used to wear a candy black-cherry paint job with candy red flames. It was a little gaudy. The front bumper will get painted the new body color, silver, and the rear bumper probably will get the bumper ends, and little dagmars chromed, while the lower pan will get painted body color. Give me a freak’n brake.